Write a story or fairytale of [at least 100 words primary 1- 4] [at least 300 words primary 5-7] not copied from any other source. The story must include a monster good or bad, but it doesn't have to be about the Loch Of Mey Monster that is up to you. The winners will receive a T Shirt, a special Loch Of Mey Monster 'Bedroom door plaque', a signed book and maybe more! 'A Beautiful Monster' suggests our Monster may have come from another world ! Is there life on another planet? What is it? Where is it? Write a story or draw a picture about life on another world... There will be a prize for the best story and the best picture from age groups Primary 1-2, 3-4 and 5-7 . The competition to find the best 'Monster' story writer from pupils attending primary schools across the North of Scotland has been completed. The competition was launched at the beginning of the year by Graham Winkle the author of 'The Loch Of Mey Monster' and involved entries from Caithness to Aberdeenshire. The beautiful original drawings from the Loch Of Mey Monster series of children's books can be seen in a small exhibition at Jim Bews book shop, Thurso. This set of small, simple yet lovely pictures capture the landscape of Caithness and the age and wonder of the children involved in the stories. The third book in 'The Loch Of Mey Monster' series; "A Search For A Monster" was launched on Saturday 1st December 2007. In the most stunning and lengthy story so far we find out the answer to one of the ultimate questions.Does The Loch Of Mey Monster really have a mate? "A dark shadow engulfed the shed a gentle breeze brushed their faces then a huge silent figure landed beside them. A number of children around the County were thrilled to be awarded special framed pictures and certificates signed by the author and artist at the end of term assemblies. The competition was to draw the best picture or write the best poem about the monster. 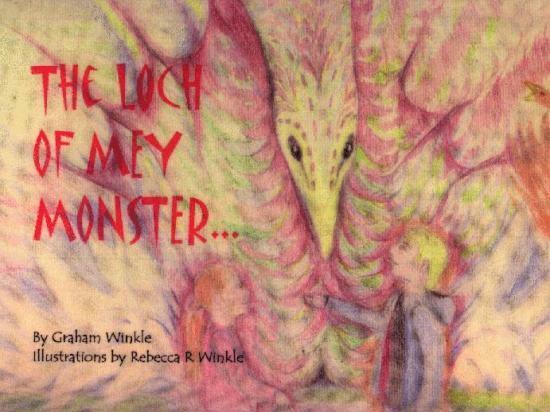 A new Children's book is now on sale in Jim Bews Thurso, Simply Unique at East Mey and the Castle Of Mey - 'The Loch Of Mey Monster' Written by Graham Winkle and illustrated wonderfully by Rebecca R Winkle.from Scarfskerry Caithness. 'The lowlands of Caithness have and invoke so many legends and mysteries sometimes I feel I really do see the monster flying in under cover of the geese' - Graham Winkle Graham's first novel is described as a 'delightful book' by Clarence House and 'beautifully illustrated' by Little Tiger Press.